- Watch TV for Free! - Receives UHF/VHF TV Signals. - 30dB Low Noise/High Gain Amp. - Great for in Home & Portable! Indoor HDTV Antenna’s will also work for people that live within 1 - 80 miles of the TV broadcast towers. For people to live farther away than 10 miles the broadcast towers, the indoor antenna will still work but you will possibly not receive all the available TV channels. The channels you receive will depend on what area you live in. Most people in the USA will be able to receive all the major networks like ABC, NBC, CBS, Fox, CW, MyTV, Ion, Ion-Life, qubo, PBS, Create, THIS-TV, Retro-TV, LWN, and more in HD. Most people in the US will also receive channels like Cozi-TV, Bounce, TUFF-TV, Antenna-TV, foreign-language, local, independent and more. Watch Sports, Movies, TV Shows, Sit-Coms, Dramas, Reality, News, Weather, Food Shows, Home & Garden shows and more. 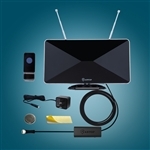 Yes, all of the HDTV antennas that we offer at TV Antenna Sale.com will work with standard tube TVs, when connected to a Digital to Analog Converter Box. Note: most every HDTV manufactured since 2006, comes with a built in ATSC Digital Tuner. Yes, all of the TV Antenna's we sell are easy to install. The Indoor TV Antennas simply plug the power supply into a regular wall socket and then screw coaxial into the back of your HDTV. If you have a standard television you apply the coaxial into your digital to analog converter box then plug your digital to analog converter box into your television. 7. Do You Charge Taxes? 8. What is the Cost for Shipping? Free Shipping on Every Order Everyday! 90 Day Money Back Guarantee - But First, If you are having troubles, please call us, so we can diagnose any installation or equipment problems. Every Antenna comes with a 2 Year Warranty. This is a great product to cut the high cost of cable! The product works well. Only wish I knew ahead of time what channels to expect. This was an excellent choice. The antenna works great. As I live in an area in town that is difficult to internet receive reception ( this is according to some local internet providers in the town, when I asked about service) This antenna works wonderfully. I receive 11 channels clearly.